Plastic bags are found everywhere – they line our trashcans, tangle themselves in telephone lines, float across busy highways and drift into the ocean only to end up being eaten by a seal or turtle. After they serve their purpose of holding our groceries, plastic bags are disposed of without a second thought of where they end up next. However, two propositions on the upcoming Nov. 8 ballot for California look to make sure plastic bags do not continue to pollute the planet. Proposition 67, or the California Plastic Bag Ban Veto Referendum, seeks to uphold the legislation to ban plastic bags that was introduced in Senate Bill 270 in September 2014. Senate Bill 270 banned single-use plastic bags throughout the state. Proposition 67 would prohibit both plastic and paper bags and authorize stores to sell recycled paper bags and reusable bags for a minimum of 10 cents per bag. Stores would receive the revenue from the sales to either cover the cost of providing the bags or provide educational materials about reusable bags. Another proposition, Proposition 65, or the Dedication of Revenue from Disposable Bag Sales to Wildlife Conservation Fund Initiative, looks to reallocate the revenue into the Environmental Protection and Enhancement Fund. The state fund would support environmental protection initiatives such as habitat restoration, beach cleanups and drought mitigation. If both propositions are approved, the one that receives more “yes” votes would determine how the revenue from the bag sales are used. Plastic bags may be convenient during our shopping trips, but they are doing more harm than good. According to National Geographic, we use more than 500 billion plastic bags every year and, because the bags are so easily discarded, many are swept into rivers or drains and end up in the ocean. This makes plastic bags among the top 12 items of debris found along coastlines, according to the Department of Public Works of Los Angeles County. And once the bags are there, they do not go away for a very long time. Plastic bags are made of a type of plastic called polyethylene. Because polyethylene is not biodegradable without special treatment, items made of it rapidly accumulate in dumps and garbage patches in the ocean and can take more than 300 years to decompose. Plastic bags are not only environmentally detrimental, but they also take up space. It is easier to use one reusable bag than have a bundle of plastic bags clog up your drawers at home. We need to vote to approve both Proposition 65 and 67 to ensure that the planet is protected from the harmful effects of plastic bags. With Proposition 67, we can make sure we do not introduce more bags into the landfills, while Proposition 65 will help us undo as much environmental damage we have already caused. For more information on the propositions and other ballot measures in the upcoming Nov. 8 election, refer to your voter information guide. ENG – We are manufacturing plastic bags in Turkey. We produce transparent bags and printed bags. Together with these bag bans, we started to pay attention to the use of bio plastic. TR – Biz Türkiye’de plastik poşet üretimi yapıyoruz. şeffaf torbalar ve baskılı poşet imalatı yapıyoruz. 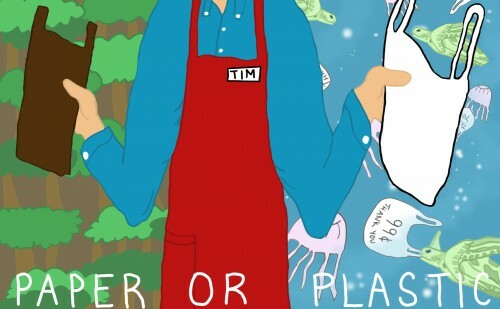 Bu poşet yasakları ile birlikte, bio plastic kullanımına özen göstermeye başladık.